Union members on Long Island and across the nation are fighting back after the Supreme Court's decision in the Janus vs. AFSCME case. A divided court ruled that unions in the public sector could no longer collect agency fees from employees who refuse to join the union. Local unions in New York State moved into action long before the Republicans engineered this decision through the theft of a Supreme Court seat, which benefits only corporate America. Union leaders and rank and file members started pounding the pavement last year to talk to their co-workers one-on-one to remind them that sticking with the union means a better life. Funded by right wing zealots like the Koch Brothers, the union haters wasted no time approaching union members, urging them to drop out of the union. Fortunately, we are not alone in this fight. 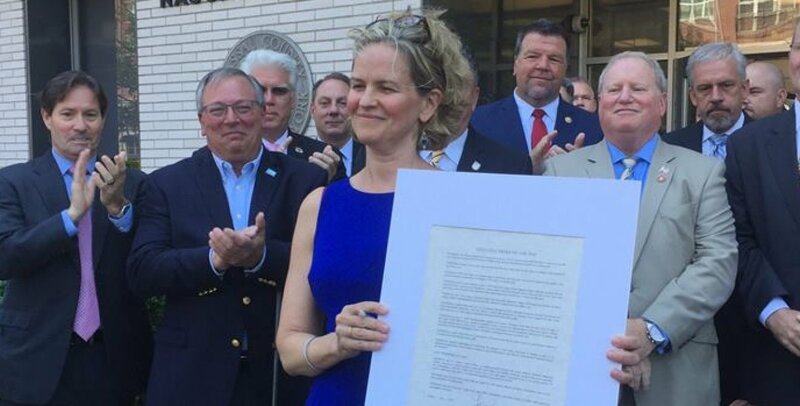 Governor Cuomo and County Executives Steve Bellone and Laura Curran signed Executive Orders protecting union members from harassment and intimidation safeguarding their personal information. Upon signing the order, Governor Cuomo said, "The Supreme Court did what Republicans and big business have sought to do for years - attempt to undermine the strength of the labor movement. But not here in New York. Not now, not ever." The fanatical right wing corporate agenda is all about putting their fingers on the scales and trying to weaken unions in order to keep working men and women from getting ahead, from demanding a fair share of the wealth they help create. So, while our opponents try to divide us, we will work even harder to reach our members and unite our labor movement. That's the commitment we make to working families and our communities.